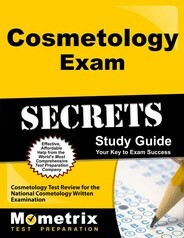 To pass the written portion of the cosmetology exam, a candidate must score 70 points out of 100. To pass the practical portion of the cosmetology exam, a candidate must score at least 70 points out of 118. 1. What were light-emitting diodes (LEDs) originally designed to treat? 2. What process would be occurring if you forced liquid into the negative ends of a positive pole? 3. To what facial type would you want to give width to the forehead? 4. A client with canities has which type of hair? 5. Upon what should you base shampoo selection for a client? B. The condition of the client’s hair and scalp. C. The client’s regular shampoo. 1. D: Light-emitting diodes (LEDs) were originally designed to treat wounds. This type of light therapy quickly flashes a concentrated beam of light onto the skin. Now used in cosmetology, this light therapy reduces redness, smoothes wrinkles and lines, and induces blood flow in the skin. This type of therapy also helps with acne-prone skin. With LED treatment, there are different color lights that should be used for different treatments. For example, a red LED light is used to address redness of the skin and aging treatments. Alternatively, blue LED lights are used for acne-prone skin. The main contraindication of LED therapy is they are not to be used on clients with seizure disorders. 2. C: Anaphoresis is the process used during electrotherapy that occurs if you force liquid into the negative ends of a positive pole. The positive and negative poles in electrotherapy are opposites and produce different effects. For example, on the one hand, the positive pole (anode) produces acidic reactions, closes pores, soothes nerves, reduces blood supply, contracts blood vessels, and helps to firm tissues. On the other hand, the negative pole (cathode) produces alkaline reactions, opens pores, stimulates nerves, increases blood supply, expands blood vessels, and softens tissues. Other processes include iontophoresis, cataphoresis, and desincrustation. 3. A: With a triangular facial shape, try to create width in the forehead. A narrow forehead and a wide chin and jaw line characterize this facial shape. When styling, consider creating a soft bang to hide the narrowness of the forehead. You can also create volume at the top and near the temples to assist in creating the desired look. With a square facial shape, try to round out the client’s face. Silhouetting the face will help to create this look. For a round facial shape, add length to the face. To do this, add height to the top but not the sides. For a diamond-shaped face, decrease the width around the cheekbone. To achieve this look, hair should stay close to the cheekbone and be fuller at the jawline and the forehead. 4. B: Canities is also called gray hair, which is caused by the natural loss of the pigment melanin. There are two types of gray hair, which include congenital and acquired. Congenitally gray hair is gray hair that is present before birth. This is particularly noticeable with albinos, who lack all pigment, including hair, skin, and eye color. Another type of congenital gray hair is that which occurs in patches. Old age is the reason for acquired gray hair, and genetics plays a role in this type of graying. Finally, ringed hair is also a type of gray hair in which bands of the hair will lose pigment and appear gray. 5. B: When preparing to shampoo a client’s hair, you should consider the condition of the client’s hair and scalp. Because there are a number of different shampoos on the market, different clients will benefit from different shampoos. A client’s hair may be classified in a number of ways, including oily, dry, normal, or treated. In addition, the scalp may also be oily or dry. Another important reason to consider the client’s hair and scalp is that a client may have one type of scalp and a different type of hair. Knowing what product will work best in a client’s hair, you will be able to provide the client with the best service and will be able to recommend the right products to your client. Ace the Cosmetology test using our Cosmetology exam study guide with practice questions. 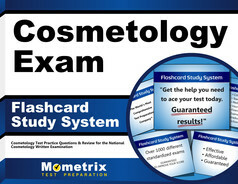 Quickly Solve Difficult Cosmetology Test Questions with the Cosmetology Flashcard Study System.